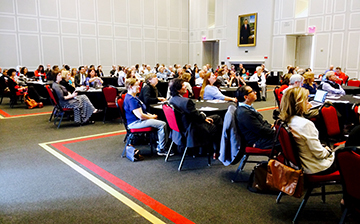 The Riggs Alumni Center was packed with UMD faculty engaged in brain-behavior research. Participants came from the Clark School, CMNS, BSOS, ARHU, Public Health, Public Policy, Agriculture and Natural Resources, the Smith School of Business and many other parts of the university. More than 160 faculty from at least 50 disciplines at the University of Maryland met together in College Park on Sept. 19 for a full-day Brain-Behavior Initiative Workshop, organized by the Neuroscience and Cognitive Science program and the Institute for Systems Research. The goal of the event was to introduce these researchers to each other, and to begin to outline what a boundary-crossing brain-behavior initiative connecting them might look like. Provost Mary Ann Rankin welcomed the participants via videotape, and three University of Maryland deans—Darryll Pines, Clark School of Engineering; Jayanth Banavar, College of Computer, Mathematical and Natural Sciences; and Greg Ball, College of Behavioral and Social Science—spent large parts of the day at the event. Representatives from the University of Maryland’s Division of Research and the University of Maryland School of Medicine also were in attendance. The morning featured a whirlwind of 80 one-minute presentations by participants, introducing themselves and their research. These exciting presentations were the catalyst throughout the day for impromptu meet-ups and discussions among faculty who had never before met each other, or realized what collaborative ideas might be possible between their areas of research. In the afternoon, participants worked together in small groups facilitated by staff from the Center for Leadership and Organizational Change. Here, faculty pondered strengths, needs, and possibilities for the future. A final plenary session gave everyone the chance to distill what was learned during the day. Again and again, participants remarked how amazed they were at the breadth of brain-behavior related research being done across so many different fields. “Physicists are talking about behavior, engineers are caring about the nervous system—something special is happening here,” remarked Dean Greg Ball at the end of the proceedings. The initiative is receiving a lot of attention at both the University of Maryland and the University of Maryland Baltimore, noted Dean Darryll Pines. In the coming weeks, the initiative’s organizing committee will review and organize the comments, ideas and suggestions from the workshop, and prepare a report and proposal about the initiative for Provost Rankin.